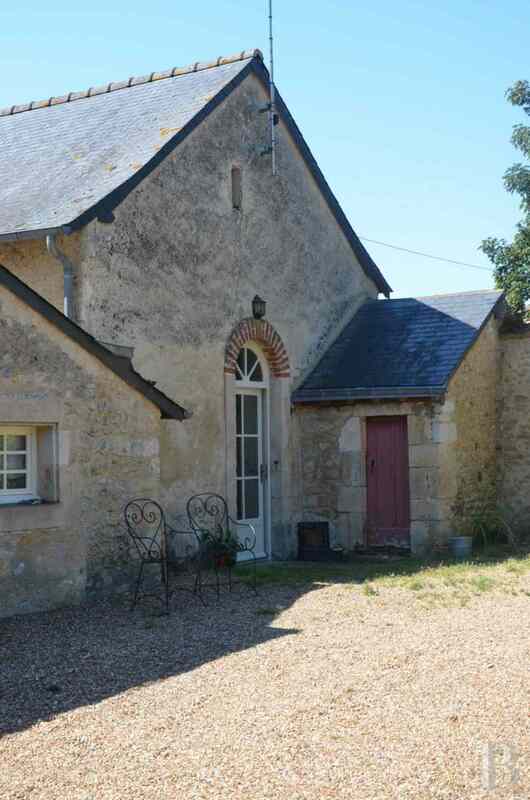 In the area around Le-Mans, 230 km from Paris. 10 km from two A11 and A81 motorway interchanges. 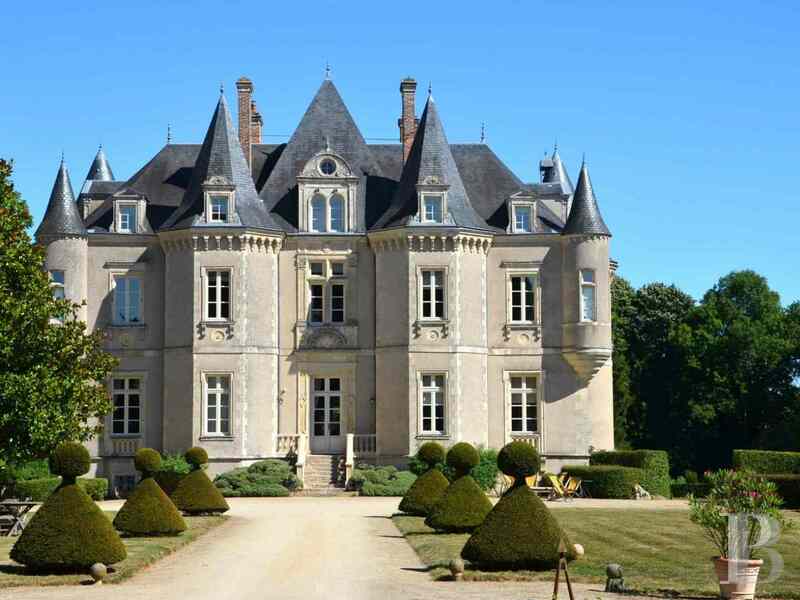 30 minutes from two TGV train stations, with 55-minute links to Paris and 105-minute direct links to Roissy-Charles-de-Gaulle. 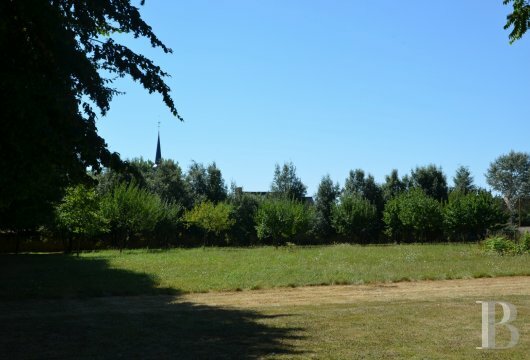 25 minutes from Le-Mans aerodrome and another 10 minutes from the town, its old Plantagenet centre and its various events (“Cours et Jardin”, etc.). The 24-hour Le-Mans endurance car race takes place around an internationally renowned road circuit, where the Porsche driving school is to be found. 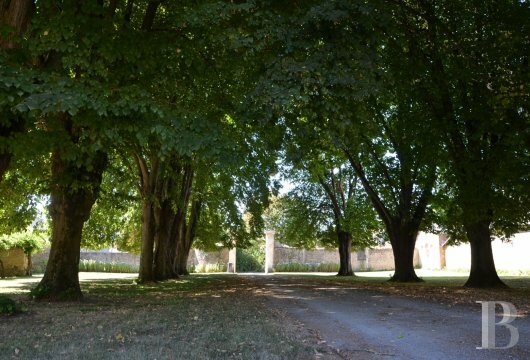 Two golf courses are a good 30 minutes away: the Golf-du-Circuit (set in the middle of the circuit, by the mythical Hunaudières straight) and the Golf-de-Solesmes. 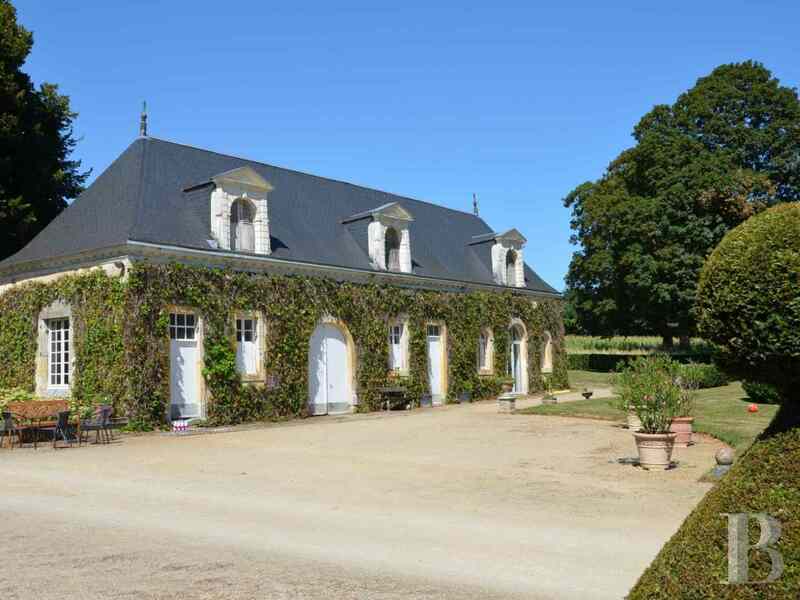 35 minutes from Le-Pôle-Européen-du-Cheval equestrian centre. The village has all local shops such as a bakery, a butchery and a small supermarket as well as a doctor. A small town just a few kilometres away has more shops and amenities such as a supermarket and a secondary school. 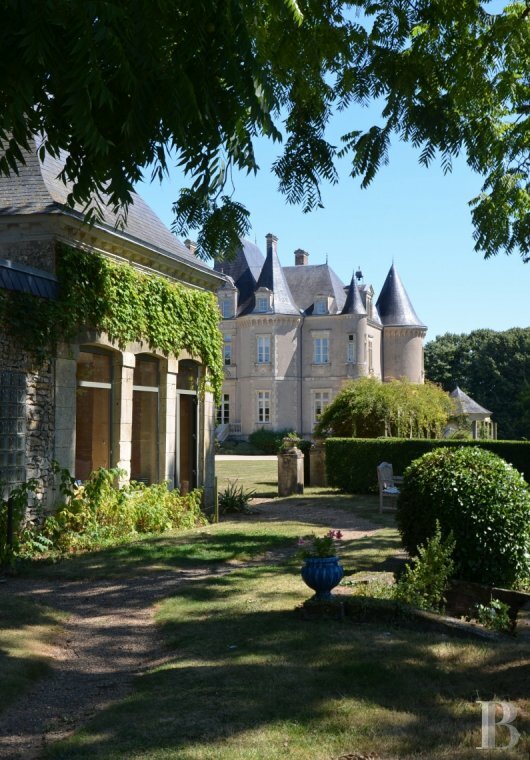 This chateau once belonged to Madame-de-Montesson and was the first building to be constructed in a Renaissance style by architect Pierre-Félix-Delarue. 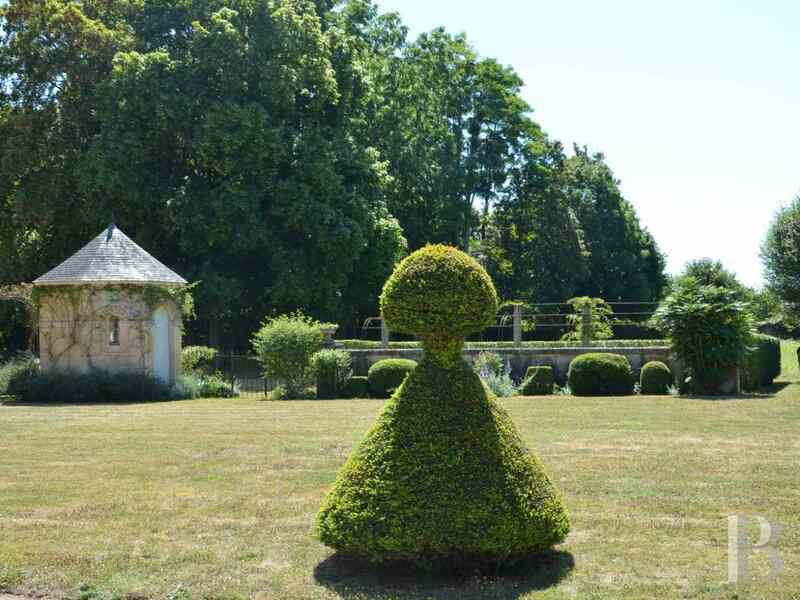 It was built in 1842 on the site of an old stately home that dated from the late Middle-Ages. 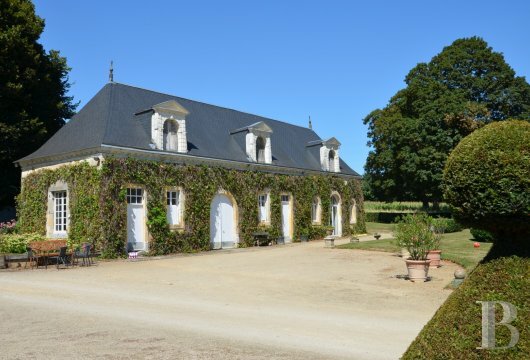 The outbuildings reflect decor characteristic of the middle of the 17th century (cornices, fluted modillion friezes and a roof dormer with a pediment). The chapel was constructed in 1846. The entrance to these premises, enclosed by high walls, is marked by impressive stone pillars. 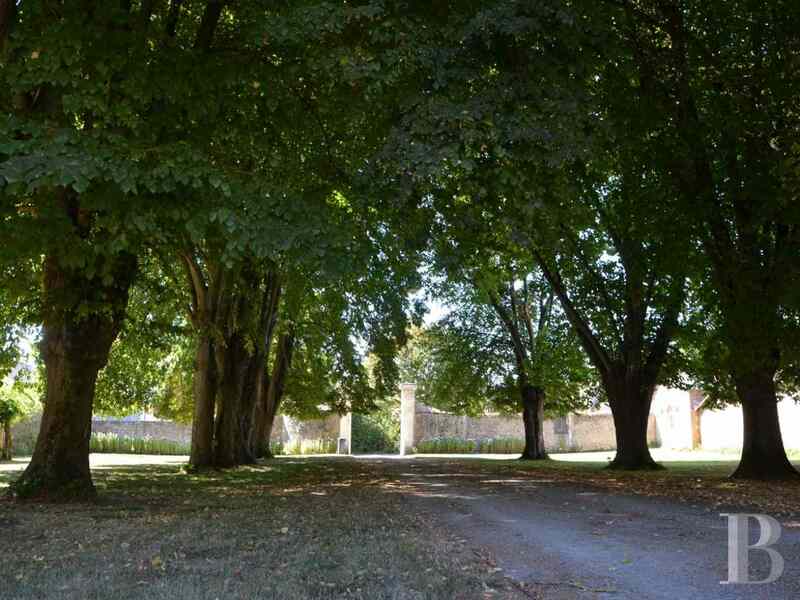 A driveway, lined with superb trees, crosses the closed entrance courtyard, enclosed by large outbuildings. 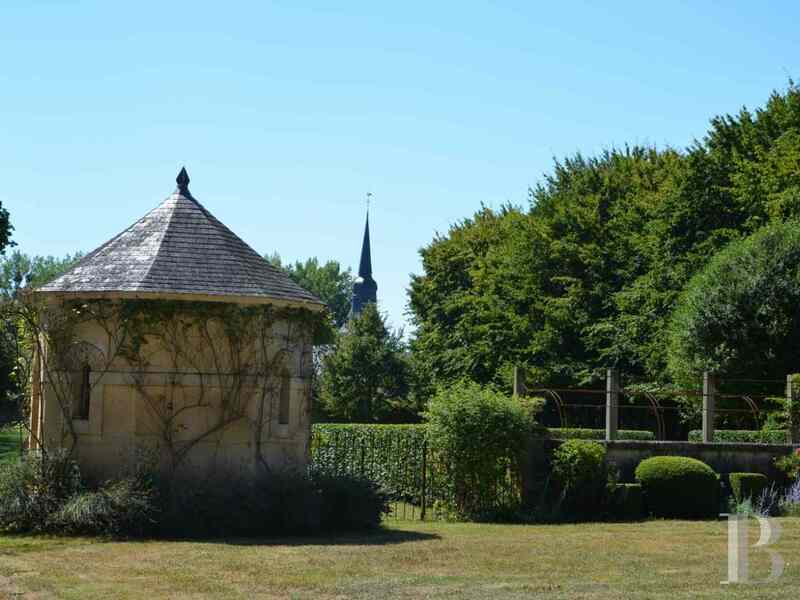 Behind the latter, two pavilions face the chateau between the main courtyard and the garden. The chapel is on the left-hand side. Beyond extend grasslands and woods. Parklands continue, on the right-hand side of the main courtyard, as far as walls, separating the property from the village. 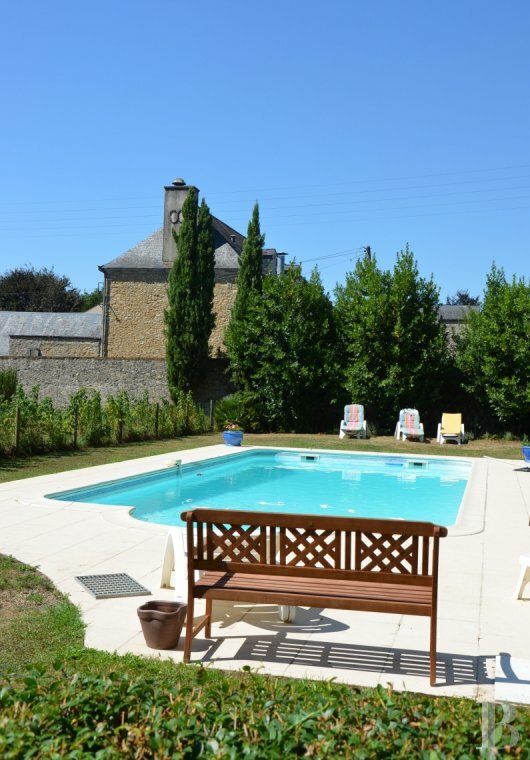 The swimming pool area is on this side, near to the outbuildings. Behind the chateau, a stream runs along the border of the parklands and the view stretches out over grasslands. 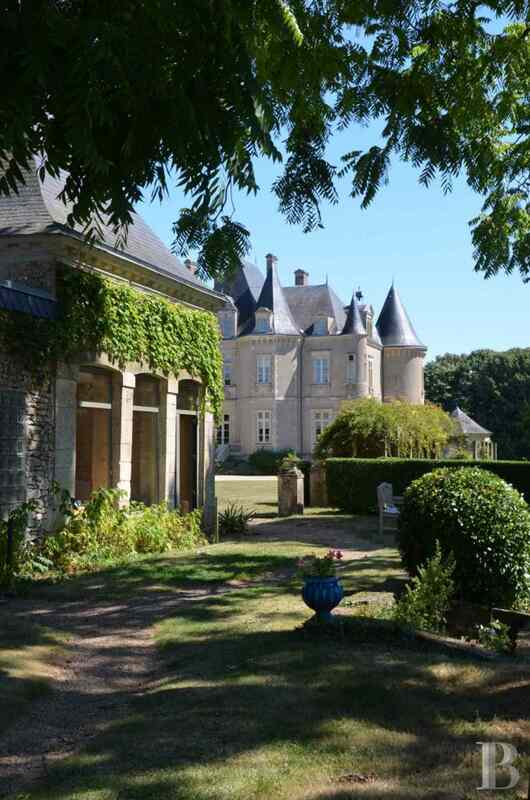 The entrance facade of this rectangular chateau features a central projection, flanked by two polygonal towers, and corner turrets enhanced by corbelling. The rear facade has two round corner towers and turrets featuring corbelling. The latter crown a balcony which gives the old billiards’ room, now a large lounge, an outside entrance. 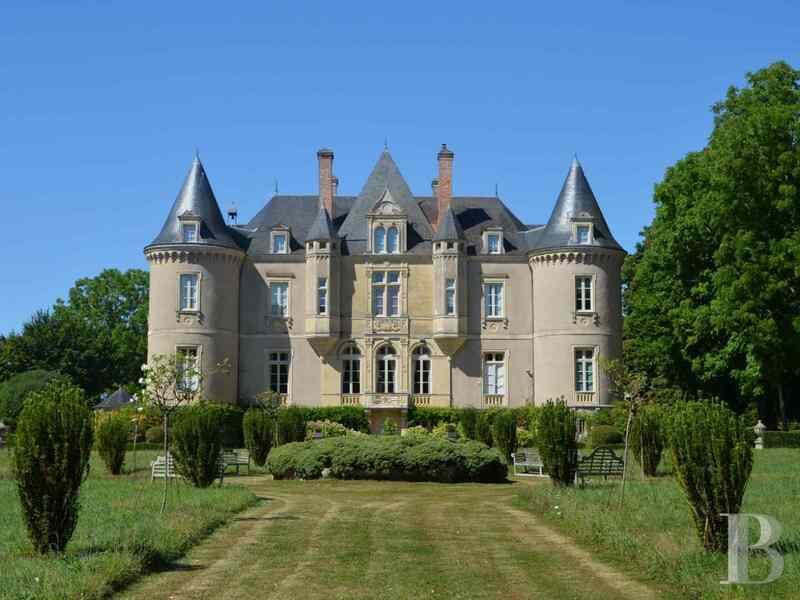 They are enhanced with medieval decoration comprising imitation machicolation and battlements. Most of the decoration is to be found on the projections. 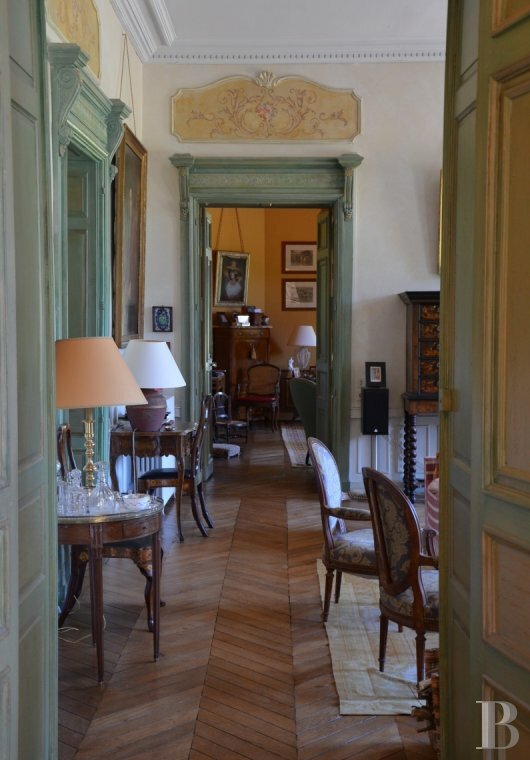 Moulded stone pediments and balconies are adorned with the Montesson and Ogier-d’Ivry family coats-of-arms. 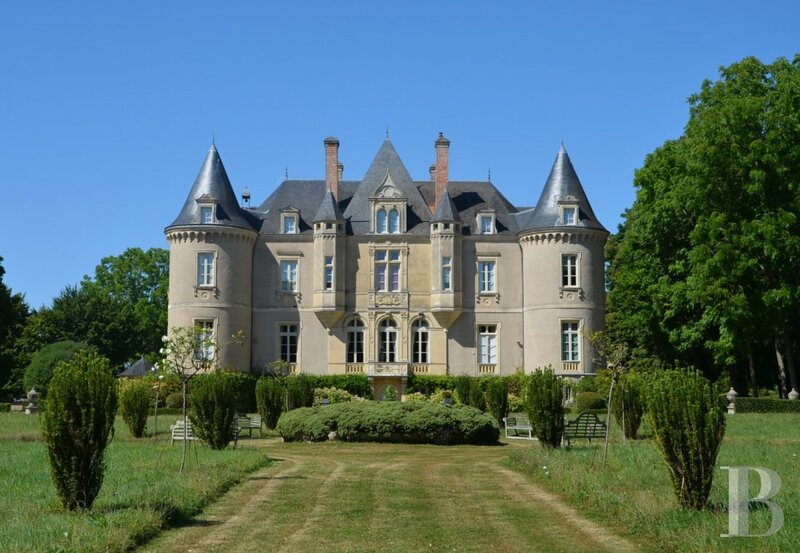 Facing east-west, this luminous chateau underwent major renovation works 20 years ago when all the roofs were redone with Angers slate, all the doors and windows were changed and double-glazing was installed. In addition, the plumbing and electric wiring was redone and heating was installed, whilst the bath and shower rooms as well as the toilets were renovated. A partially vaulted basement, running under the entire house, has direct access from the outside. It comprises an old kitchen, under a cross-ribbed vault, adorned with a large fireplace and still featuring its old flagstones, a fruit store, cellars, a linen room and a boiler room. A back stairway goes right up to the top of the house on the left-hand side of the building. The ground floor opens in the centre via its vestibule, next to which is the main stairway. On the left-hand side, a bedroom suite includes a bathroom and toilet. There is a pantry on the right-hand side. 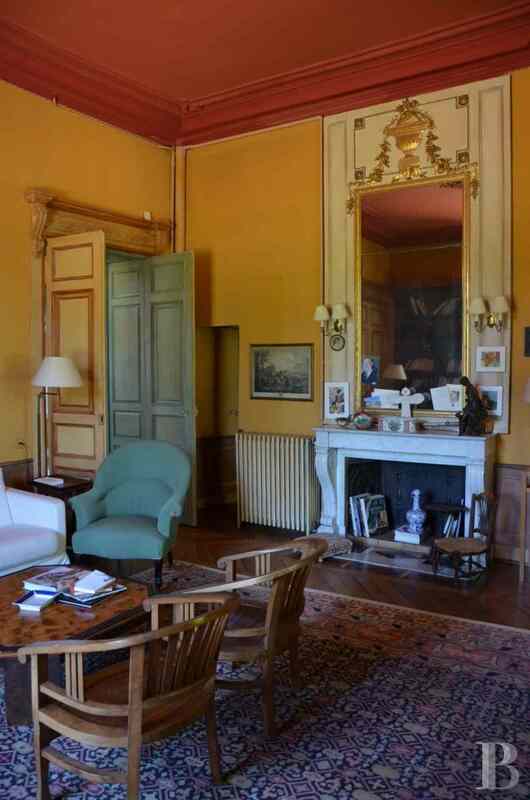 In front, double doors open into a reception lounge which leads, left, to a lounge-library and a study in one of the towers. 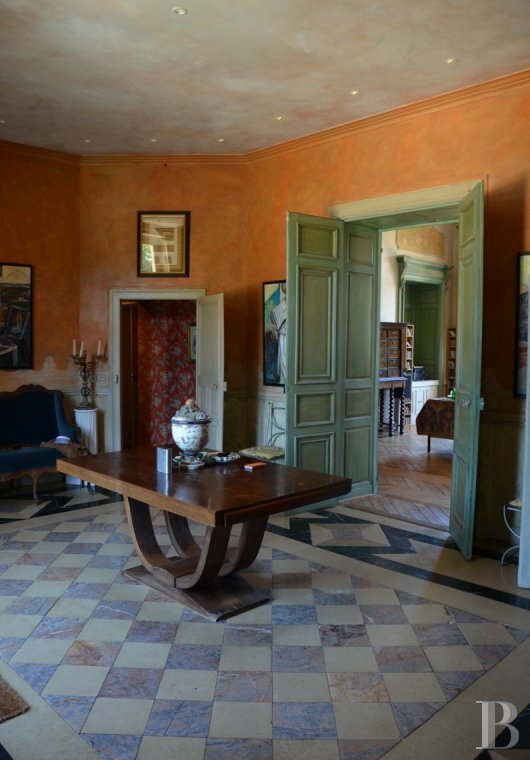 On the right-hand side, a vast dining room is followed by another small dining room in one of the towers. The vestibule features a pink and black, stone and marble mosaic floor whilst the reception rooms have herringbone pattern, oak wood parquet flooring. Ceilings are enhanced with cornices. All the rooms have double doors, four sets of which face one another in the central lounge, once the billiards’ room. 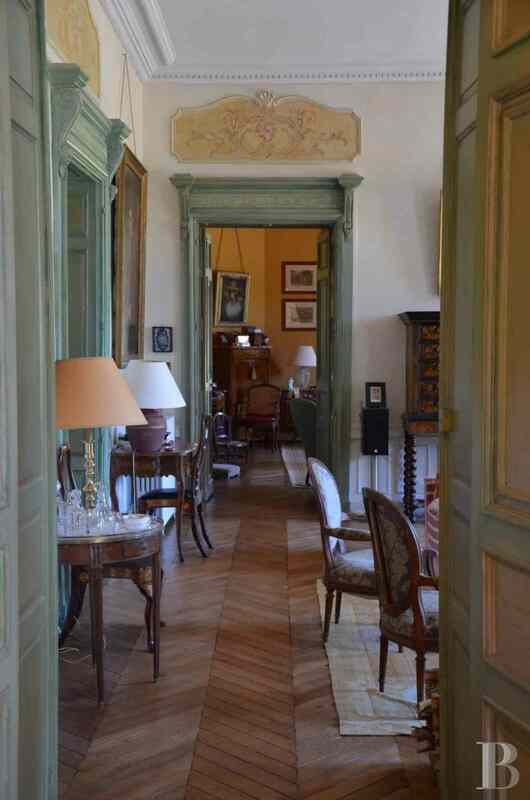 The moulded architraves surrounding the doors are crowned with entablatures. 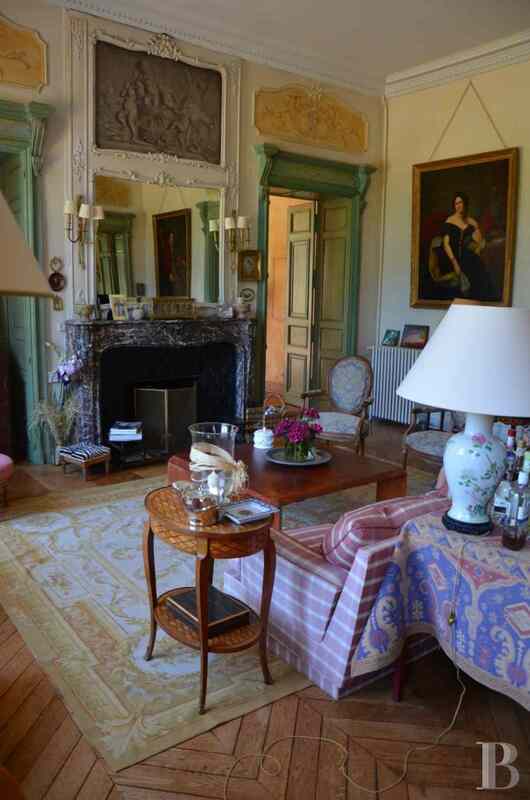 The marble Louis XV style fireplaces have trumeaux. Upstairs, reached via a hanging stairway housed in a tower, a central corridor provides access to six bedrooms as well as four bath and shower rooms with separate toilets. The floors are carpeted or covered with herringbone pattern, oak wood parquet floorings. Walls are painted or covered with fabric. Each bedroom has a marble fireplace. This attic floor, reached via the back stairway, comprises five bedrooms, three bathrooms and a kitchen. A self-contained flat could be created. The parquet floors are covered with linoleum. The outbuildings, forming the oldest section of the estate, delimit the entrance courtyard. 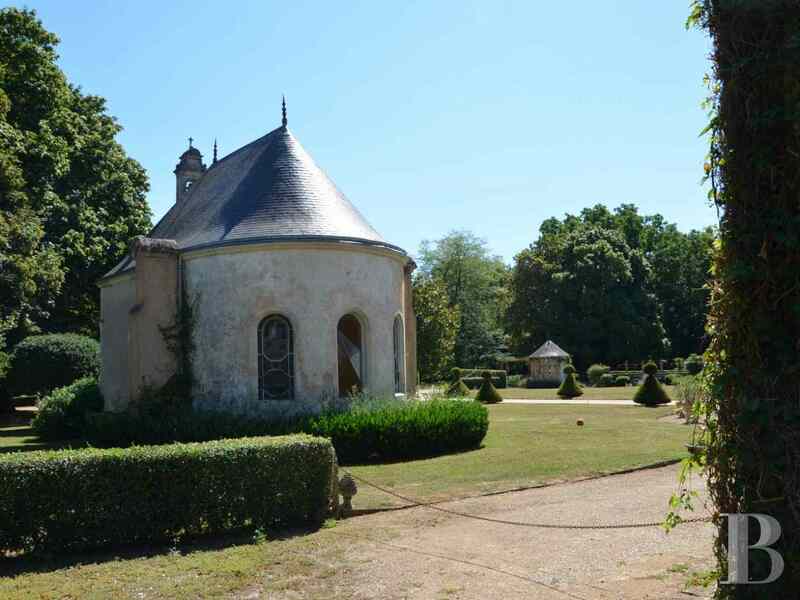 A 16th century farm is enclosed by two 17th century pavilions. On one side, a caretaker’s cottage, with an independent entrance, has been renovated. It precedes farm buildings, old cowsheds and barns awaiting renovation. On the other side, the old gardener’s cottage has been transformed into a pool-house, behind which are large wooden farm sheds. 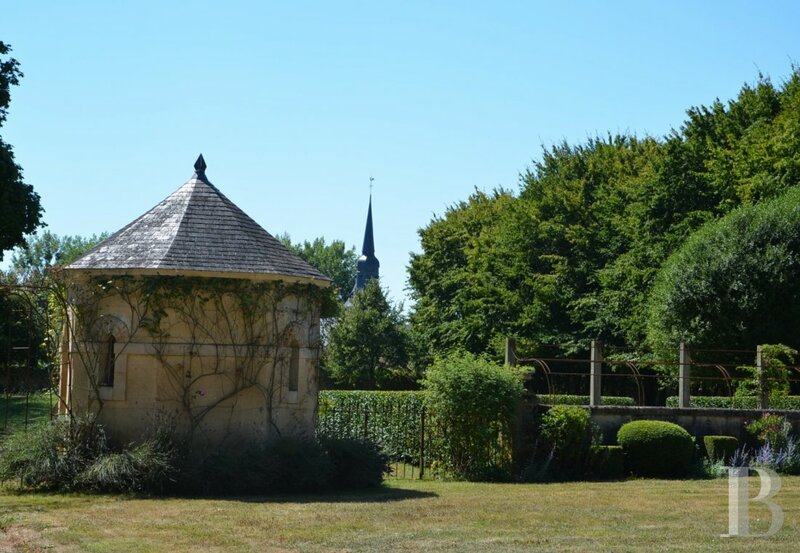 The 17th century pavilions are used as three garages, storage areas and an artist’s studio, featuring wide openings. All the outbuilding roofs were redone with Spanish slate some fifteen years ago. This cottage has been fully renovated. Its electric heating system is completed with a wood-burning stove. 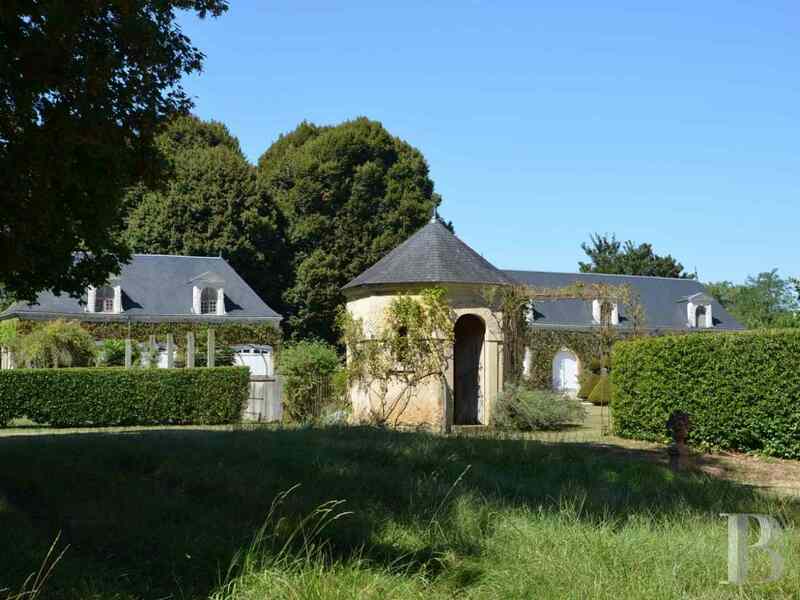 Standing at the entrance to the property, it has a 500 m² garden and an independent access. Awaiting renovation, it has many old features such as terracotta floor tiles, a bread oven and a wooden stairway for accessing the upstairs. The attic space could be converted. In use as an artist’s studio, this outbuilding has wide openings looking out over the parklands and the woods. 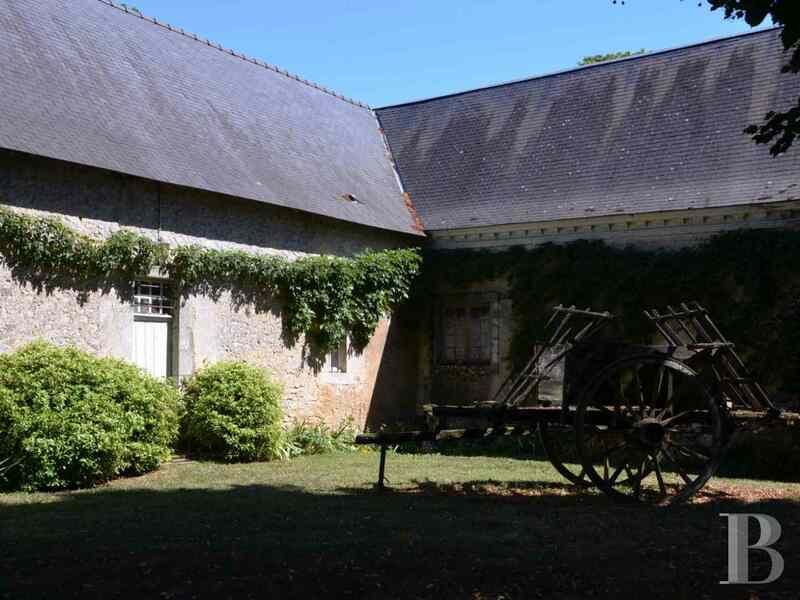 In the 17th century pavilions, facing the chateau, are some adjoining outbuildings, with attic space that could be converted. A cellar runs under one of the sections. 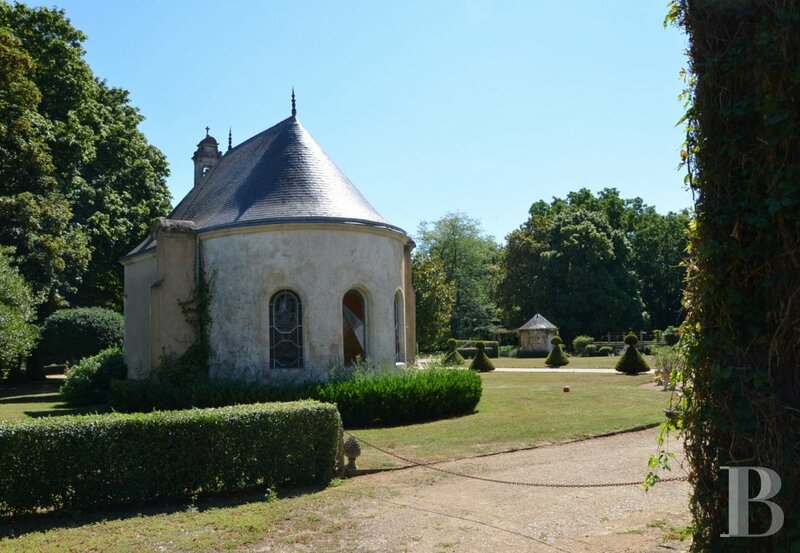 Constructed in the 19th century, this chapel is engraved with the date 1846. 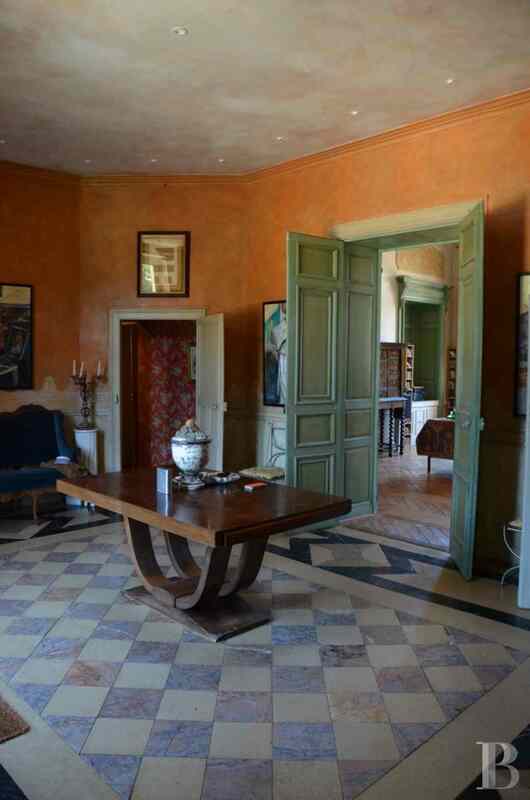 It features marble panelling, a painted ceiling and stained glass windows made by Carmelites from Le-Mans. The altar is made of hard limestone and the floor covered with white stone tiles laid in a chessboard pattern with inlaid slate decoration. The parklands, exuding a romantic air, span approx. 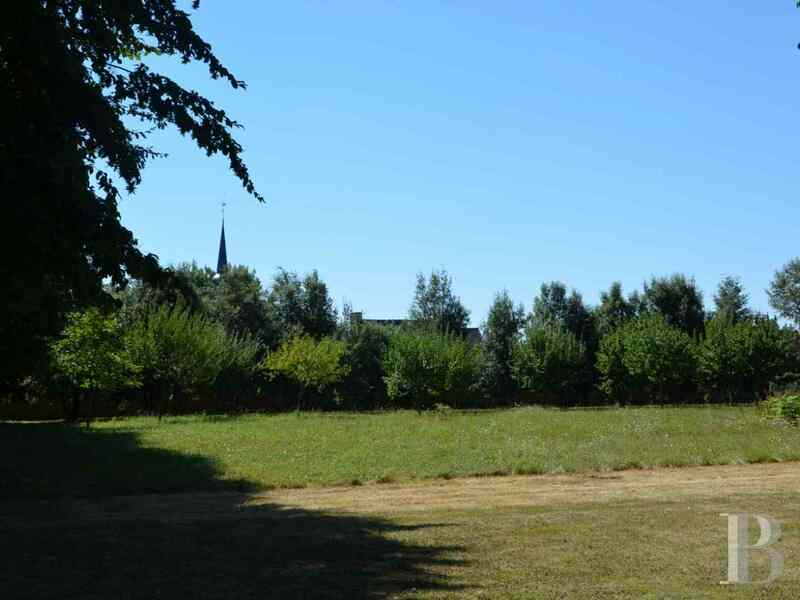 4 ha of imitation grasslands, driveways, copses and hedges. 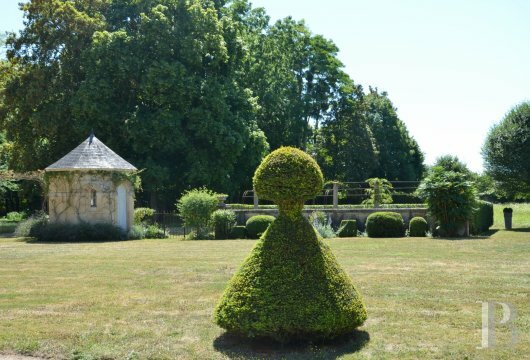 They are planted with various species of tall trees such as lime, hornbeam and oak, rose bushes and decoratively trimmed boxwood. They are delimited by a river and high walls, separating them from the village. On the east side are grasslands spanning 4 ha and a wood of the same size. 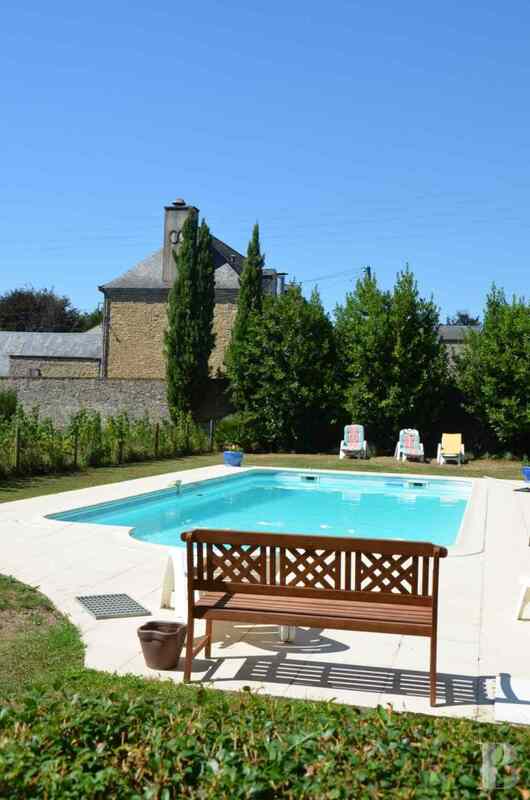 This 11x5 m swimming pool was installed in the old vegetable garden. Sheltered by the old walls, it also has a pool-house. A variety of eras meet here. 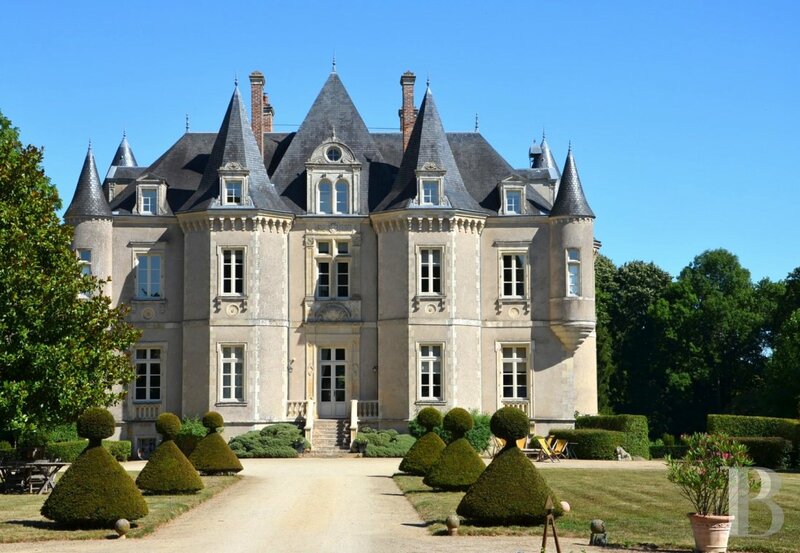 The Renaissance period inspired the clarity of this stately, 19th century chateau’s style. 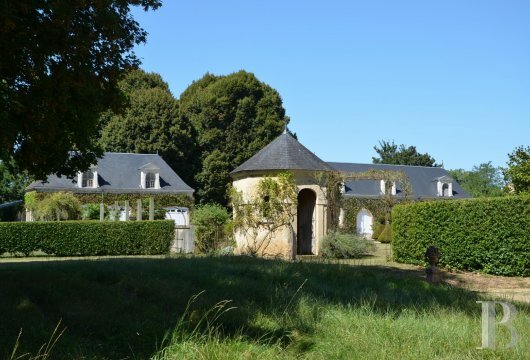 Whilst the discreet, classical elegance of the 17th century pavilions is reflected in the smooth rusticated masonry of the framing around their roof dormers. 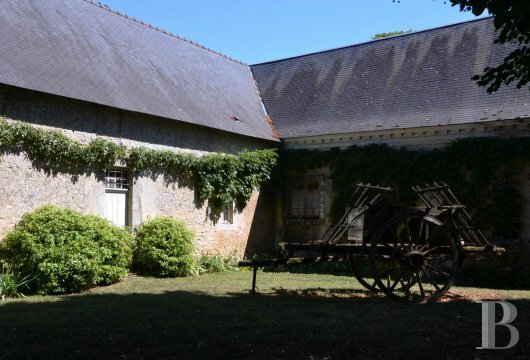 Furthermore, the outbuildings are an abundant source of ideas for potential activity projects in a region that attracts not only car racing enthusiasts but also lovers of heritage. Most of the buildings have undergone restoration works.